Today I thought I'd start to share the layouts I made at Dukes Farm. As I've mentioned in previous posts I took away with me some older photos from by Uni days and decided to make an album of these. Some of these photos are a little bit cringe worthy so no laughing! 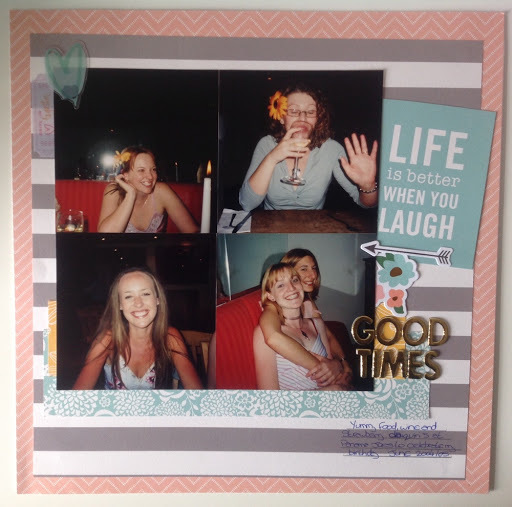 The first layout I made were photos from a girly night out in a restaurant called Panama Joes which used to serve yummy South American type food. I used papers from a Jen Hadfield paper pad I'd picked up in TK Maxx. I also used acetate embellishments from Heidi Swapp and some die cuts from Page Evans. 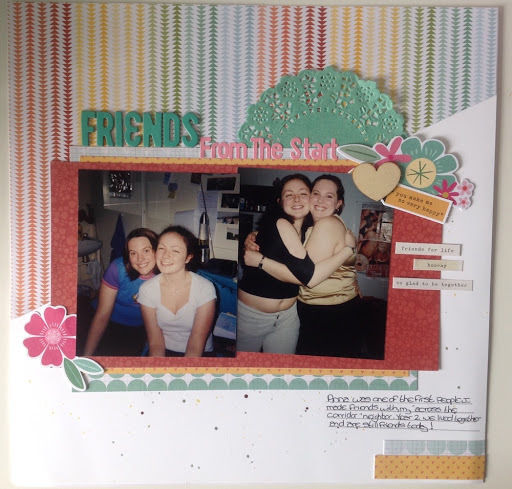 The next layout I scraped was of me and my friend Anna. Anna was one of the first people I spoke to and made friends with at uni as she was in the room opposite my in halls, and we remain friends to this day. The photos were taken in our first year and then in our last year. I used papers from an old Studio Calico collection and dies cuts from Page Evans again. The last layout I'll share today is of my brother jumping over a wall in a beer garden at the end of a booze night out, forgetting about the large drop the other side! As the photo was quite dark I went for a fairly monochromatic colour scheme with a little pop of Aqua. 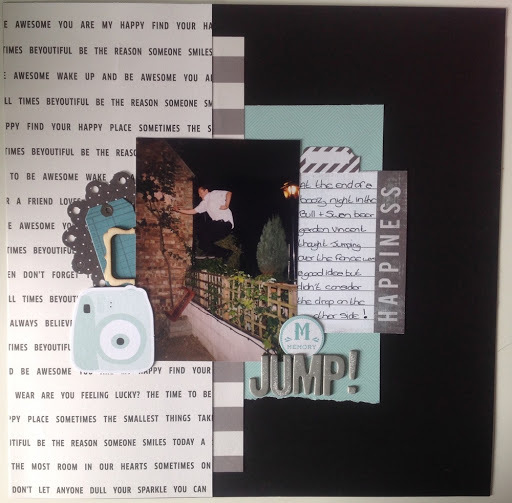 Papers are again from Jen Hadfield and a scrap from Gemma's overflowing scrap box. I also used a mix of embellishments from Fancy Pants, Dear Lizzy and a really old cut apart from Echo Park.